Here is an update to the severe storm potential for later this afternoon and evening. I also have a video briefing recorded at 3 pm you can view. All of the Ozarks continues to be in a slight risk for severe storms. The same area is in a broad 2% risk of a tornado. 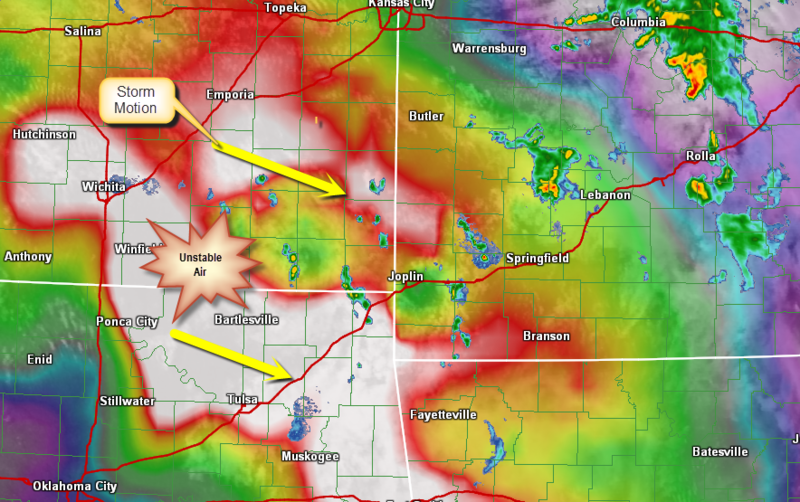 Isolated non-severe cells have bee popping up over southwest Missouri this afternoon. They do no pose much of a threat for severe storms. Areas of extreme western Missouri and all of eastern Kansas have seen the air become increasing unstable through the late afternoon hours. Storms which fire in these areas will quickly become severe and slide east southeast through the evening hours. 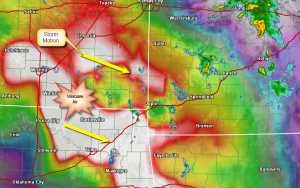 There is a boundary in western Missouri I will eye carefully for any storms which latch on providing an enhanced severe or even weak tornado threat. Otherwise, the best chance for severe weather is between 5 and 7 pm and west of Springfield. Thereafter, the storms will congeal into a large rain machine. Flash flooding will be possible over some areas of the Ozarks and a Flash Flood Watch is in effect for tonight and through the weekend. Here is by VBLOG of the severe threat recorded at about 3 pm. Stay alert! 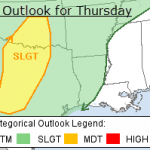 Much of the Ozarks is in a slight risk of severe storms for later today and tonight. 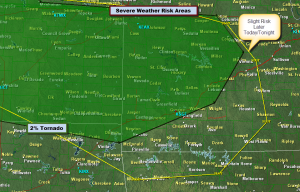 The area outlined in yellow is the slight risk and the green shaded is the 2% tornado possibility. The overall picture this morning features an area of rain with a few non-severe storms north and northwest of Springfield in western Missouri. This band will continue to move east through the morning hours. Rain may impact Springfield by later this morning and will certainly travel over areas to the north of the city. 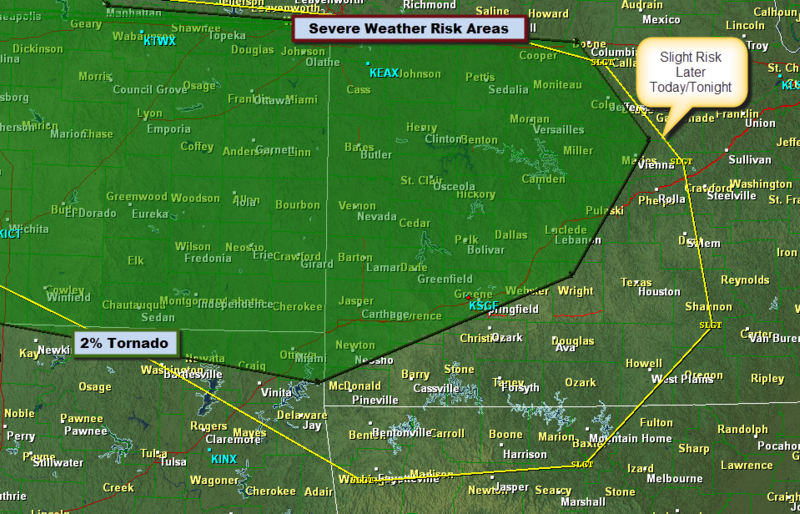 The area to be watched for severe storms later today is out west. 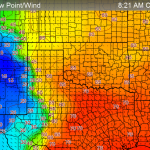 The air over portions of Kansas and Oklahoma will become unstable later today as heating combines with high humidity values. 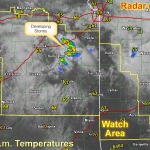 Storms will develop over this area and track east with time into southwest Missouri. The tornado threat is small but not zero. The exact details of this threat will depend on how small scale features evolve during the day. 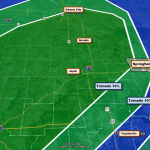 Right now, the 2% tornado risk skews north and west of Springfield. Broadly, any storms that develop will also be heavy rain producers and a flash flood watch is in effect for the Missouri portion of the Ozarks. I’ll have another update later this afternoon. Starting with later this evening, the Ozarks will experience several bouts of severe thunderstorms and heavy flooding rain potential. After much analysis and thinking, I decided to establish the next “Lock and Load” storm chase tour for this Thursday.